✨Good Saturday Morning To You! Live from the Punk Rock Flea Market Today – I hope to have a chance to share some pics of that in a bit but we shall see. I hope you are all feeling fine! ?This set I actually picked out last week and just said to myself “This will be the next auction!”. I included one of my brand new Moringa soaps which isn’t available yet but I am IN LOVE with it. ?The scents of Lime, Cedar and Ylang Ylang marry and make an almost Stargazer hue. This is a pick me up bundle with things to support the psyche on several spectrums. 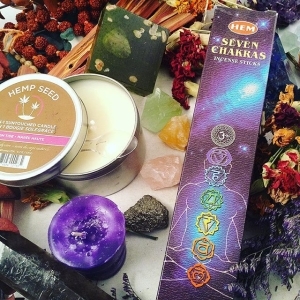 This bundle includes: 1 – Giant Tropical / Beachy Scented Natural HEMP Lotion Candle ( I love these so much I had to grab them to carry in the booth) 1 – 2.2 oz Amethyst Infused Moringa Soap with Shea & Sea Salt – Stargazer Scented (Essential Oil Blend Mentioned Above) 1 – Giant Box of Incense for Balancing the Chakric Field 1 – Menthol Calcite Chunk 1 – Golden Calcite Chunk 1 – Pyrite Chunk 1 – Rose Quartz Chunk 1 – Patchouli Votive Candle This is a great kit and retails for $60. Bidding Opens at $19.00 and goes in whole dollar increments. ?To Bid? Comment With Your Bid Tag Who You Are Outbidding ✨Winner Pays 6.00 Shipping and Handling (USA) and Rated by Weight and zip for international winners. Auction ends Sunday (tomorrow) 9PM EST. 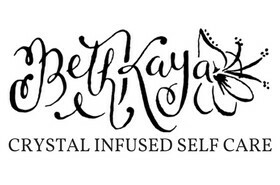 #GoodLuck✨ #bethkayaauctions #saturday #parcel #intention #metaphysical #crystals #minerals #island #beachy #incense #chakra ?sorry a lil late! !